The island of Kauai, aptly nicknamed the Garden Isle, is one of the most beautiful and picturesque in the entire Hawaiian chain. It has more beaches, rivers, streams, and waterfalls than any of the other seven main islands and is the oldest in the state. It was also recently ranked the second best island in the world by readers of Travel & Leisure magazine. With far fewer people, the lifestyle here is wildly different from Oahu. Unmatched natural beauty and a very relaxed, low-key pace of life are two staples of this tropical paradise. For anyone interested in camping, the Na Pali coast is not to be missed. Part of a 6,175-acre state park, the 16-mile stretch of coastline offers absolutely jaw-dropping views of lush green valleys, majestic waterfalls, and sheer cliffs that drop off into the crystal blue waters of the Pacific Ocean. If camping isn’t your style, helicopter and boat tours provide a less rugged option to see a truly special stretch of land. Some of the most beautiful portions of the park were used as the backdrop for the original Jurassic Park. It should be noted that while 16 miles doesn’t sound like a tremendous distance, the rugged coastline makes the Na Pali coast impossible to hike in a single day – unless you happen to be a prehistoric raptor. For those looking for a less strenuous day trip, Hanakapiai Beach, located along the same stretch of coastline, is an attractive option. It’s roughly two miles from the start of the hike to the beach with a gorgeous waterfall located another 2 miles into the valley from the beach. During summer a gentle stream feeds from the waterfall into the ocean, providing a safe place for kids to play. However, during winter Hanakapiai is one of the most dangerous in Hawaii, with powerful rip-currents and a pounding beach break. 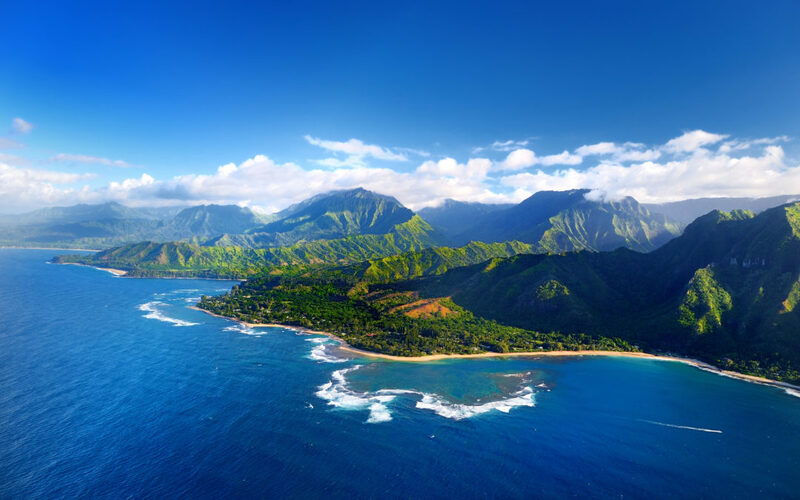 Not to be outdone is the southern coast of Kauai, which typically gets less rain than its northern counterpart. Koloa Town, about 20 minutes from Lihue, greets you with an actual tree tunnel, guaranteed to mesmerize. A wonderful day can be spent on the Koloa Heritage Trail, a 10-mile, self-guided tour that includes 14 stops of historical, geological, and cultural interest. Much of Hawaii’s amazing diversity stems from the sugar cane boom of the 1800s. Along the trail, you can see the remains of the first commercial sugar plantation, which brought roughly 350,000 immigrant workers from all over the world. All those workers were the basis for the rich heterogeneity that is part of what makes Hawaii so special. If you have a mind for adventure, Koloa Zipline is not far away and consistently rated as one of the best on the island. There may be no better place to fly through the air than in this spectacular slice of the island. Also located near historic Koloa Town is Poipu beach, which was once named America’s best beach. Green sea turtles and the endangered Hawaiian Monk Seals are the true locals of Poipu, choosing this heavenly beach as their favorite spot to rest and get some sun. Often, during the winter months, humpback whales can be seen from the beach splashing happily in the warm waters. Poipu beach is very safe, making it perfect for the whole family. For many Hawaii residents, Kauai is their favorite island to visit. The natural beauty, laid-back lifestyle, and breathtaking beaches make the Garden Isle a great place to relax and unwind. If your goal is to party and drink the night away, this leisure island wouldn’t be the best fit. But for natural beauty, de-stressing and hanging loose, Kauai is just the place.